Hey! 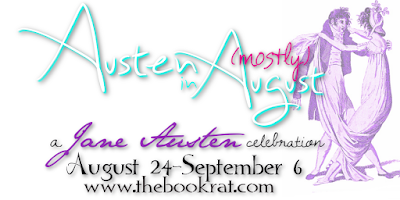 It's Austen Movie Weekend! Tomorrow night we'll be live watching & twitter chatting up a storm for part one of Sense & Sensibility, so definitely pop in on Twitter with the hashtag #AustenInAugust to get in on that craziness. But until then, we're taking a look at something I had high(ish) hopes for. Was I a fool? Let's find out! 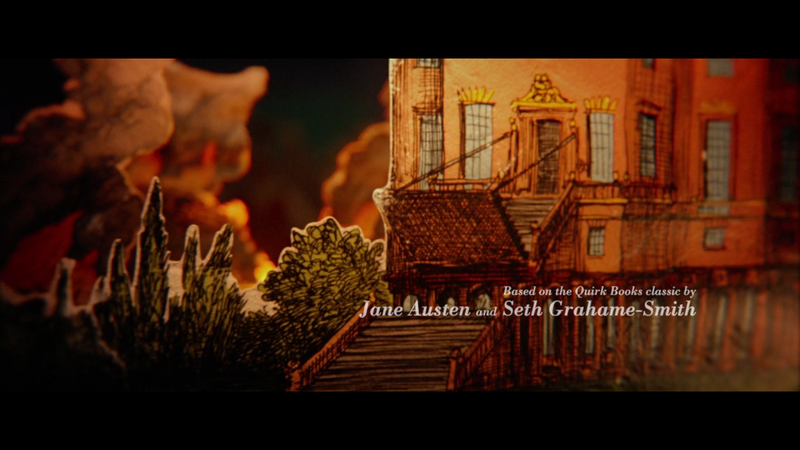 As I'm sure we all know by now, I was not a fan of Seth Grahame-Smith's Pride & Prejudice & Zombies. It still stands out as one of the most personally disappointing books I've ever read, not because I was expecting a masterpiece, but because of the great potential it had to be really, really fun. As big an Austen fan as I am, I'm not very precious about retellings: a good idea is a good idea, and I'm willing to see favorite stories remixed, picked at, completely dismantled and put back together in new configurations — it's all fair game, so long as whatever IT is is well done. BUT because I thought the idea has so much potential, I was actually really excited when I heard it was being adapted for the big screen. I figured that all of the issues I had with the novel were really issues with SGS' writing, style, and choices, and that in new hands and playing out right in front of my eyes, it would probably be the cheeky, irreverent, hilariously well-mannered bloodbath that I'd been expecting from the book. . . And it was, in some ways. But in others, it really enforced just what it was that I didn't like about the book, but in new ways. There are times when it does strike that fantastic balance between Regency precision and mores with light-hearted gore. There are occasional lingering shots that manage to meld the minutiae of a Regency-era woman's daily life (the pleasantries and the primping, the delicate manners and the subtle social ploys), with the harsher "realities" of life amidst the zombie horde — scenes of the Bennet girls joufully polishing their guns, for example, or strapping knives to thigh-holsters hidden under their empire-waist dresses. If it melded these more frequently and more thoroughly (a complaint I also had with the book), then I would have liked it heaps more. It was, by and large, a very attractive cast (except for Darcy, who is supposed to be srsly handsome, but the actor did nothing for me — soz, Darce! ), and most of them did seem to strive for that playful-serious balance; they didn't take themselves so seriously that they seemed cheesy, but they also didn't treat their characters so playfully that you couldn't believe them as Regency-era characters. This is perhaps the first adaptation (and likely the only) in which I found Mr Collins actually delightful. I mean, he's still a buffoon, but Matt Smith played him hilariously, and if I'd rewatch this movie for anything, it'd be for the brief scenes in which Collins makes an appearance and does something random. [Side note: I've liked other Collins performances, but that is a different thing entirely than liking the character of Collins himself. Mostly, I just find him creepy, especially in the films, where the actors really amp up that factor, but Matt Smith was an awkward delight. I also liked Lady Catherine, a bit, and thought Lena Headey played her with a great deal of subtle, quirky humor. I don't know what to say about the fact that I liked both Collins and Catherine, but I did. So there's that. The cinematography was actually pretty great, and there was a cool little illustrated intro that was pretty neat. They managed to wedge the now apparently-obligatory "Darcy in a wet shirt" scene in, not just once but THREE times. (I think. At least that.) And Darcy wears a leather tailcoat? I'm sure they were trying to make him more badass and fierce, but it actually came across as really, really cheesy. Though I'm sure someone in a production meeting somewhere was very pleased with themselves for that idea. Much like the book, the movie never really found its footing for me. The tone remains pretty uneven throughout both, and I don't think either team (Quirk and SGS or the producers/director/screenwriter(s) of the adaptation) figured out where to skew their focus so that the whole thing could seem cohesive. By not playing up either the Regency aspects or the zombie aspects, the focus felt very split, and not in a way that worked to add tension or humorous contrast. Instead, it feels too literally like the "mash-up" that it is, and like Austen's original story is just the incidental vehicle for zombie-slashing (or vice versa), which in all likelihood, it is. 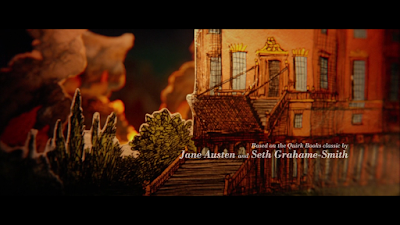 Again, I'm not expecting a nuanced masterpiece, but both story and script really do seem like work-for-hire rather than a labor of love, and if you're going to do the story (which again, could be REALLY FUN), you need to love Austen at least a little bit. You need to care about at least some of the details. It never felt like that was the case (which was my #1 complaint against the book). The film also drove home my #2 complaint, which was style: unfortunately, at least in the beginning, they chose to embrace SGS's crudeness as a poor substitute for actual humor. Now, I know, I know, this makes me sound like the "I bet you're real fun at parties. /s" girl, and yeah, I'm not a huge fan of crude humor in general. There's a time and a place in which it really does work, but mostly it seems cheap and pointless to me. But for PPZ, there really is solid reasoning behind why it just doesn't work, and it's that at its heart, it's still a Regency Romance. In order to play up the humor in the absurdity of an Austen/zombie mashup, you really need to capitalize on the Regency aspects of the story. Aside from obvious changes caused by the invasion (like the girls training to kill), the further you get from a real Austen "feel," the less successful the mashup becomes. It's no longer Austen with OMG ZOMBIES HOW HILARIOUS AND WEIRD. It's just a bad zombie movie with girls in pretty dresses. You have to keep the heart of the story intact in order to successfully adapt it (and if you do, you can do just about anything). Lastly, it felt chaotic. This goes back to the two-stories-mashed-into-one complaint, but everything felt rushed and never quite fleshed out (ba dum tss); the fantastic dynamic character reversal that Pride & Prejudice is known for never really comes to pass, or when it does, it's forced and tacked on rather than actualized and demonstrated. We never witness Darcy's careful transformation, and the Darcy that proposes at the end doesn't seem all that far removed from the Darcy who coarsely shatters a wine glass and stabs someone in the face at a card table in the opening scene (which, can we talk about that? Actually, forget that, let's not.). And other than rescuing Lydia, no foundation is really built for Elizabeth's change of heart, so that when she does claim to now love Darcy, it's not all that believable. So all in all, it wasn't horrible, but it still didn't deliver what I hoped it would. And that's really all I have to say about it. 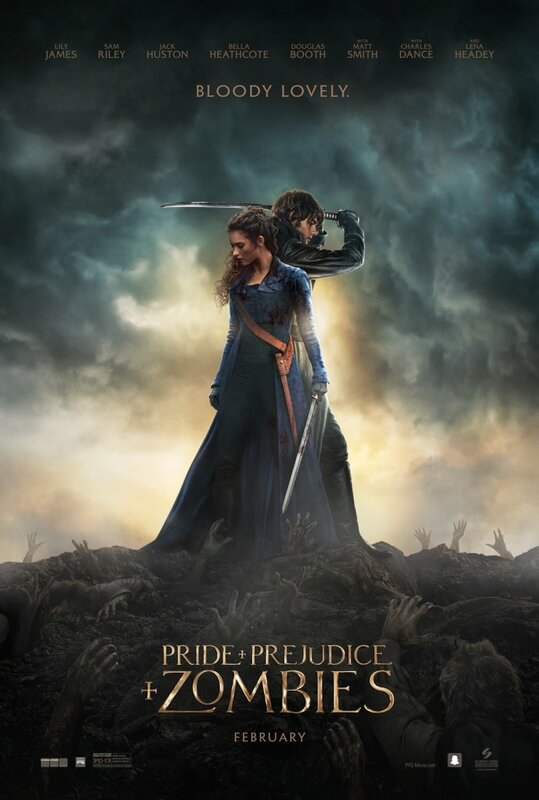 I'm done ranting about Pride & Prejudice & Zombies, and I'm done being disappointed in its lack of realized potential. I think I need to just move on from this one and let it go. . . The good news is, it's available to rent on Amazon for only $0.99 right now, and there are worse ways to spend a buck. I haven't read the book OR seen the movie. I can't decide if I want to, either. I think I would be like you and not really love it. I'm sad, but not surprised. I was hoping that, if the movie couldn't be as good as the book was supposed to be (we agree in our disappointment of the book), at least it'd be a fun zombie movie. But it sounds like it kinda failed all around. That's sad, because *I* could do a better job and I'm not a pricey movie studio. Blargh. Also, in that gif...is that Darcy? The shovel-faced tween boy with a Kristen Stewart expression? I....seriously? OK to me the movie was supposed to be ridiculous because the book was ridiculous. Although, with that being said that is why I like both the movie and the book. Some of my favorite things in both the book and the movie was the fact that it was so far out there. Yet it still had some of the Austin aspects from pride and prejudice that made put on my to buy list. It was very disjointed as a whole but that's why it works for me. I took it as art and did not expect a whole more. For me, the movie had its ups and downs (I didn't read the book.) Pros: the quirky, campy fun of the first half, Mr. Collins (! ), and the Bad@ss Bennet sisters doin' their thing. Oh, and the Hunsford proposal scene, which made me laugh out loud. Cons: the casting of Darcy, and Wickham, and the story-mess that resulted when they tried to piece a plot together in the last third of the movie. So basically, Misty, I'm with you on this one. Unlike other Austen movie adaptations (like the 1995 S&S, for example) this movie did NOT make me want to read the book. I just saw this a couple weeks ago and mostly found it funny. Collins, the Hunsford Proposal and just the idea of such a mash up with zombies had me entertained, but I agree about Darcy not being a good choice or that the basis for both their change of heart and the romance was missing. Still haven't read the book and might not for a long while. Enjoyed your break-down on it. Smith's portrayal of Collins really made this for me. Darcy was kind of OK, I like James as Lizzy and the casting of Jane, but I agree the pace of this and the two stories felt disjointed, which threw off the pacing. The scenes not included like Liz meeting Darcy at Pemberley where she sees another side of him is non-existent. That would have been one way they could have made this Darcy more tender and changed.